By Mary Mares-Awe—TO CELEBRATE INTERNATIONAL Education Week, the Board of the Chicago Chapter of the Fulbright Association, in partnership with World Chicago, and the Institute of International Education (IIE), invite you to a Panel Presentation on Cyber Security. The area of cyber security of concern to virtually everyone using the internet. We rely on the internet for communication, commerce, education, work, and data storage. However, with the extensive usage of digital data, there is an ever-increasing risk of personal information and intellectual property being compromised by cyber-based attacks. Cyber security involves protecting our information by preventing, detecting, and responding to online threats. The event will feature an expert panel presentation led by an FBI Special Agent who will discuss Cyber Security at the personal level, and provide tips on how individuals can stay safe online. Another member of the panel, Mr. Then Yilmaz Halac, will speak about Security at the public safety level, using his experience as the Managing Deputy Director for the 911 center, during the NATO summit in Chicago. This will be an excellent opportunity, to learn about this important topic from highly respected experts in the field of cyber security. WHAT Panel discussion on Cyber Security, Q&A, and networking. Use www.transitchicago.com to plan your route. COST FREE for current visiting Fulbright Students, Scholars, and Teachers. The cost is $10 for Fulbright alumni, each adult family member, and/or guest(s). RSVP by November 15, 2016 using the form below. 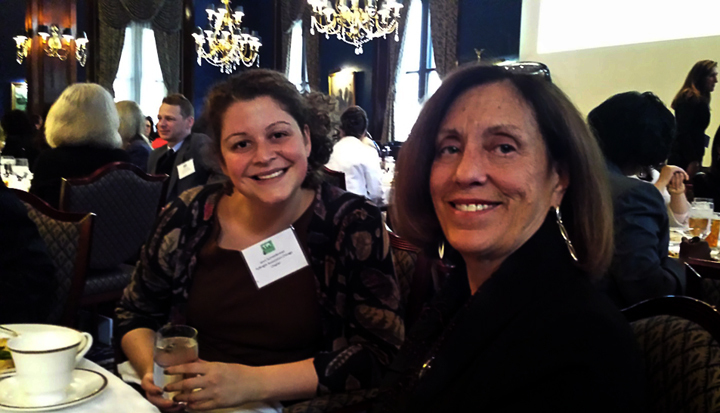 By Mary-Mares-Awe–MEMBERS OF THE CHICAGO CHAPTER of the Fulbright Association and six visiting Fulbright students celebrated International Women’s day by attending the 15th annual luncheon at the Union League Club on March 8, hosted by World Chicago and the International Trade Club of Chicago. Attending the lunch were visiting Fulbrighters: Milena BerBenkova from Bulgaria, Eliana Solange from Angola, Eliane deLarminat of France, Aisa Lipscombe of New Zeland, Teuta Peja of Kosovo and Annie Khalid of Pakistan. Representing the chapter were Mary Mares-Awe, President of the Chicago Chapter and Dr. Sandra Martins, one of the chapter’s newest members. The luncheon featured Nobel Peace Prize nominated author and, environmental and human rights advocate, Sheila Watt-Cloutier. She is also the president of the Inuit Circumpolar Council of Canada. During her speech Ms. Watt-Cloutier outlined the effects of human-made climate change on the lives of not only the aboriginal people of the North Pole, but on the whole world. “The north pole is the air-conditioned of the planet”, she said and when that starts to break down the whole world feels its affects from severe weather to droughts and floods. She also said it’s vital for the world to understand that “the actions or inactions of the global community are starting to impact very deeply the human rights of people who dependent on their environment on a daily basis”. She also added that it’s not just people who depend on their environment like the Inuit, but everyone is impacted by climate change. The author emphasized the importance women can play in bringing attention to the devastating toll climate change is inflicting on people’s lives and the worldwide economy. The visiting Fulbright students found the talk fascinating and the luncheon “just wonderful”, as one of them said. The students also expressed their gratitude to the Members of the Chicago Chapter board for their sponsorship. Following the luncheon, students got the opportunity pose for pictures with Sheila Watt-Cloutier. Some of them even purchased her latest book, The Right to be Cold, which she personally inscribed. 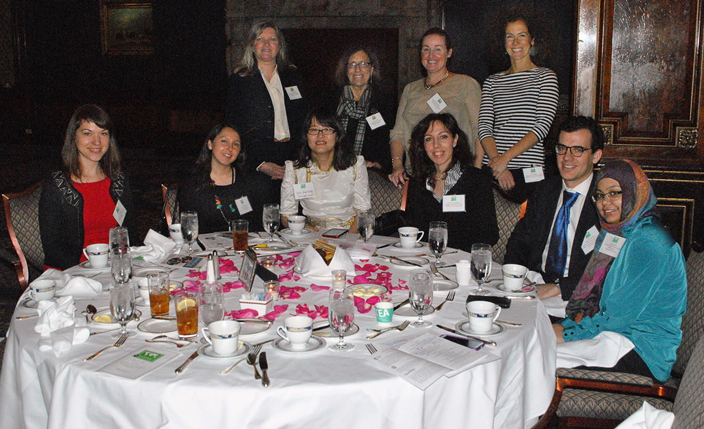 The luncheon was sponsored by the Chicago Chapter of the Fulbright Association and co-sponsored by the Institute of International Education, IIE. 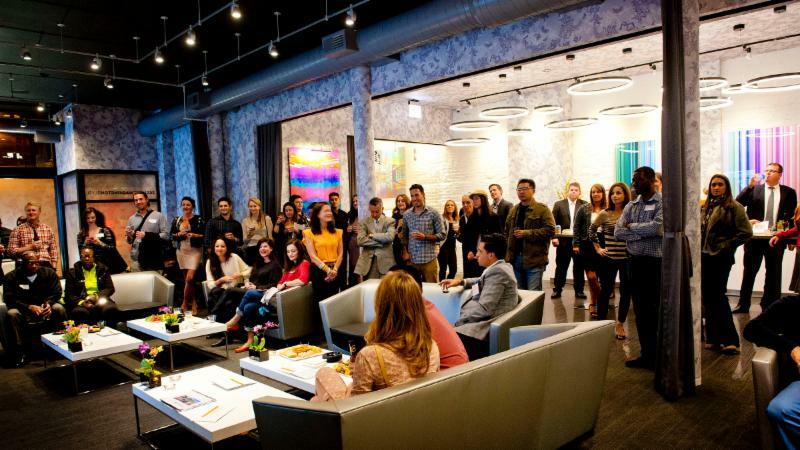 WorldChicago’s Annual Young Professionals Career Night is back! JOIN WORLDCHICAGO’S popular careers night: Four speakers from the private, nonprofit, and public sectors talk about their internationally-focused professional experiences. SPEAKERS Each featured professional will give a brief introduction on their career and the path (or paths!) that led them there. Then each speaker will lead a small group in a round-table discussion and Q&A. With four group rotations, you’ll have the opportunity to hear from each group leader about how previous international experiences influenced their careers and how they got to where they are today. This event is ideal for young professionals, college students, graduate students, recent graduates, and those looking for new opportunities. Front row: Elina Ruka from Latvia, MFA in Photography, Columbia College, Claudia Figueroa from Chile, MPP, University of Chicago, Onontsatsal Gantsog from Mongolia, Loyola University Chicago, Katerina Psimogiannou from Greece, Anthropology at UIC, Josep Mª Nadal Fdez from Spain, DePaul University and Shafia Imtiaz from Pakistan, MPP, University of Chicago. Standing:Mary Mares-Awe, Fulbright Chicago Chapter Board President, Board Members Marilyn Susman and Meredith McNeil, and PhD Public Health candidate Kate Vergara from Peru. 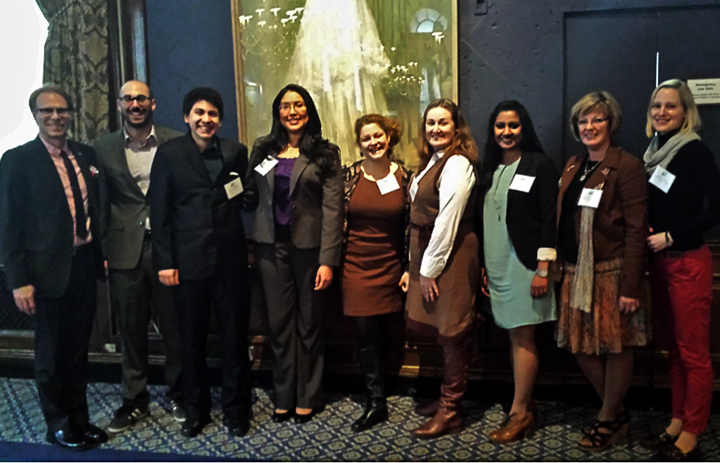 By Meredith McNeil—MEMBERS OF THE CHICAGO Chapter of the Fulbright Association and visiting Fulbright students attended the 14th Annual Chicago celebration of International Women’s Day on Monday, March 9th. The event took place at the stately Union League Club of Chicago. 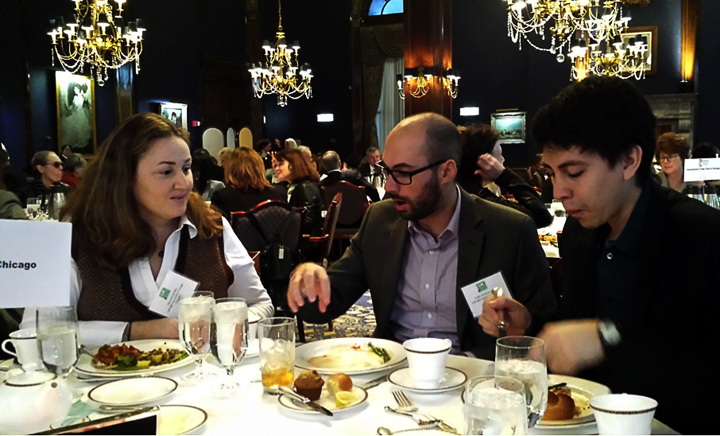 The event was hosted by WorldChicago, the Union League Club of Chicago, and the International Trade Club of Chicago. The Fulbright Association Chicago Chapter not only was a partner organization for the event, but, eleven current and former Fulbrighters and friends of Fulbright attended the luncheon. The message of the day pertained to immigrant women and their contributions not only to the U.S. economy in terms of labor and entrepreneurship, but also to women’s role in academia in this country. Both Carole Segal, co-founder of Crate & Barrel, and Michele Wucker, Vice President of Studies at The Chicago Council on Global Affairs, highlighted in their presentations the value of immigrants’ contribution to the U.S. at universities and in long term academic, and skilled careers. Ms. Wucker stressed the importance of correcting immigrant stereotypes in this country by changing the focus to those who come for education and their children’s educations rather than negative representations. Ms. Segal lamented the brain drain that occurs in this country when student visas expire and how increasing the number of work visas would bolster the U.S. economy. It was refreshing to hear women of civic engagement discuss the importance of international intellectual talent that the U.S. gains from immigrants to this country. Other topics included immigrant women’s lack of legal options, immigration as a political card, and the effect the politicization of immigration has on women. According to one of the featured speakers, women currently outnumber men in the “foreign born” category in current U.S. immigration statistics. This directly relates to the role all women play in strengthening families. 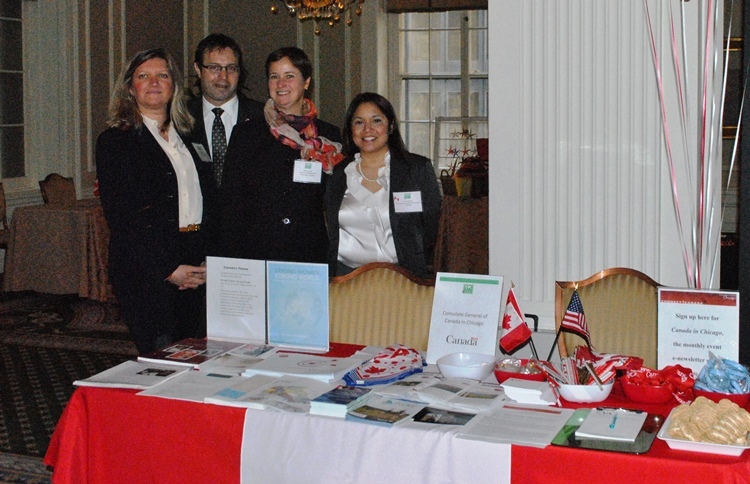 The International Women’s Day Luncheon also featured a fair of exhibitors involved in international pursuits and women’s issues, including Fulbright Chicago, the Canadian Consulate, the YMCA, and the Consulate of Sweden, among others. The fair provided a great opportunity for the Fulbright Chicago representatives to engage with other attendees and discuss potential future partnerships. Host an international student this summer! Besides these there are other hosting opportunities this summer! See below. 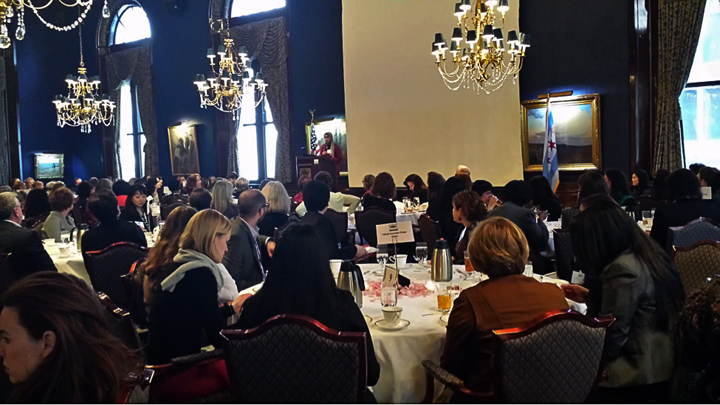 By Meredith McNeil—THE UNION LEAGUE CLUB OF CHICAGO played host for the 13th Annual Chicago Women’s Day, Friday, March 7th. 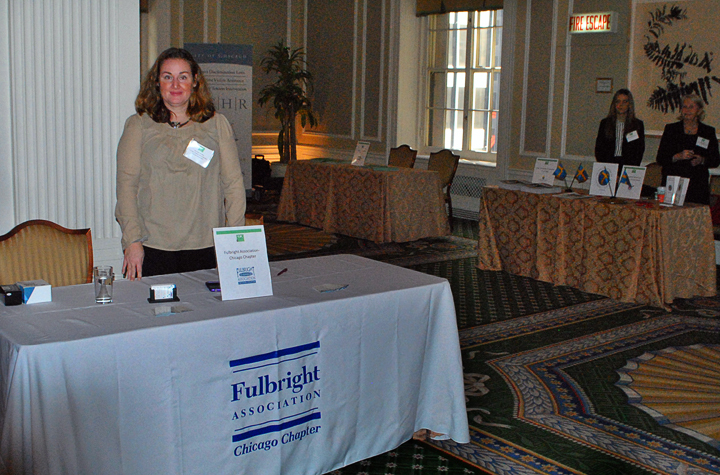 The Fulbright Association-Chicago Chapter not only was a partner organization for the event (organized by WorldChicago,) but five former Fulbrighters from the Chapter and five current visiting Fulbright students attended the International Fair and luncheon keynote speakers. The five visiting Fulbrighters attended free of charge through the generous contributions* from members of the Board, and co-sponsored through IIE. Board member Meredith McNeil gets an engineering lesson from visiting Fulbright engineering students Ander Indart and Isaac Mejía. Attendees from the Chicago Chapter Board included Ronald Harvey (President), Patricia Powell, Meredith McNeil, Marilyn Susman, and Chicago Chapter member Jenni Schneiderman. Visiting Fulbrighters were R. Schwarting (Germany, University of Chicago, Sociology), Ander Indart (Spain, UIC, Civil Engineering), Flor Fernández (Nicaragua, UIC, Masters in Business Administration), Isaac Mejía (Guatemala, UIC, Mechanical Engineering), and Preema John (India, School of the Art Institute of Chicago, Arts Administration and Cultural Policy). All three of the influential and spirited speakers highlighted the main themes of partnership and the need for males, as well as females, to be active in women’s causes that work towards change. The two cultural speakers, Dr. Rasha Mahmoud Hussein Mohammed of Cairo, and architect Carmen Vidal-Hallett of Chicago and Brazil, detailed how females are “revolutionary” in their countries. In Brazil, Vidal-Hallett made encouraging remarks about women’s involvement in environmental improvement, mainly through water quality. Dr. Mohammed’s focus was on women’s engagement in the Egyptian Revolution and how this activity has led to more men becoming active in anti-sexual harassment causes. The keynote speaker, Michèle Ledgerwood of the Center for Strategic and International Studies (CSIS), highlighted the seven Revolutions affecting our world today (i.e., information, technology, security, governance) and how women are both affected by each, and how women can affect each in a transformative way. Although the topics and speakers were varied, the message remained that women, globally, need to work together, across economic, cultural, and religious lines, in order to continue to better situations for themselves and their families, and that male participation and inclusion is necessary for future improvements. Jenni Schniederman and long-time Board member Marilyn Susman. The Fulbright table listens attentively to Dr. Rasha Mahmoud Hussein Mohammed’s description of women’s involvement in social change in Cairo. The afternoon closed with remarks from the vice president of the Union League, highlighting the well-known Chinese proverb: when sleeping women wake, mountains move. It was an excellent call to action at the end of an event encouraging positive female engagement in today’s world and positive change for all! The Fulbright Chapter attendees left with a great sense of optimism for the future.